I recall you folks are using Safari on Mac. Unfortunately, 99% of the population are not on this browser / OS combination. If you can test on Windows 2k/XP using IE 6.x and higher we should reduce the number of "issues" you're seeing/reporting. This is 2006, people. Ignoring their obviously false numbers, how long has the standards-based development mantra been part of web development now? It's unreal to me that a company could get away with shunning large segments of the market these days. But I guess if you have a client that doesn't know any better you can get away with most anything. Is it weird that I just discovered my bedroom has an overhead light? To be fair, while we've been in the apartment for a little over a year and a half I've only been in this bedroom for a few months. Still, though, I had no clue it was there. 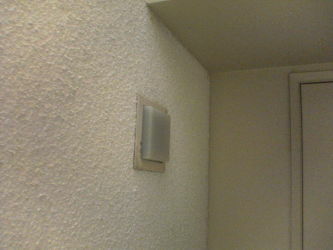 I even had a light switch on the wall that baffled me. It didn't control any outlet in the room. I'm now guessing that's because it controls this little ceiling light whose bulb probably burned out a long time ago. I'm not sure that this discovery will really affect how I light my room. That fixture is in a pretty random entry location to the bedroom, and not near anything useful. But how odd to be walking to the bathroom and all of a sudden say, "Interesting. My bedroom has a light in the ceiling." I'm getting set to head home from work, and it's about 8:35pm. Over the last three days I've probably averaged close to ten hours a day in the office. But you know what? That's my choice, not my employer's. During high school I worked at a place I really enjoyed, and I'd go hang out at work just because I didn't have anything better to do. On the weekend I'd get up in the morning, drive to the office, and stay there until I had something fun to do in the evening. I was getting paid to play with computers; why wouldn't I be there? That's sort of what I'm feeling like right now. I'm getting paid to mess around with computers. I mean, I either hang out here on the computer or at home on the computer and it just so happens that the stuff I'm doing here is cooler right now. In school I wrote all my papers using LyX, a document editor that lets you worry about the structure of your text while writing and handle the actual bits like how it'll look later. I love it before it creates really nice looking output, and typesets worlds better than a normal word processor like Word. In any case, last week I started on a document using LyX running on a G5. Then Friday I got the iMac, but all I could find online were PowerPC binaries. So I figured, hey, it's open-source. I'll compile my own. 2.6GB out of a 25mb download. Yikes. Like I mentioned on Friday, I picked up one of the new Intel-chipped iMacs for work. Between playing around Friday afternoon and this morning, I think I can give some early opinions. Yesterday afternoon I rode the Red Line up to North Hollywood to meet up with Kathy. The train was acting pretty funny: it showed up early, and then took multiple long stops at stations mid-route. Just before Universal we took the crossover to the southbound tracks and completed the trip on that side. 7th/Metro to North Hollywood, normally a 25 minute trip, took 40. Turns out the slowdown was the result of an apparent suicide try. A British woman was struck by a Metro Red Line train at the North Hollywood station Saturday afternoon when she stepped down onto the tracks in an apparent suicide attempt, authorities said. The unidentified woman, in her 40s, suffered life-threatening injuries, officials said. Authorities said she left a suicide note in her backpack. At North Hollywood half of the platform was taped off and there was a train stopped halfway into the station, so if I had to take a guess I'd say she jumped as the train was entering. Not all that great a way to take yourself out, though; the train's not moving that fast coming in. Update (Just a few minutes later): The Daily News confirms my guess that the train was entering the station and slowing down. I mentioned that Kathy and I went to two nights of music a month or so ago and that one of the artists was Adrianne. I had grabbed a couple tracks off her website and put them on my laptop before heading to South Carolina, and I found they kept sticking with me during the two weeks or so there. The cd I was ripping a few days ago was one of two Adrianne cds I ordered once I got back. I got both 10,000 Stones and Down to This. After having listened to both a couple times now "Down to This" definitely resonates more with me. I think I'm just drawn to the more raw sound and acoustic guitars. "Shout It Out" is probably my favorite track at the moment. Though I'm definitely a dyed-through Perl guy, I've been messing around with learning some Ruby on Rails over the past week or two. The Rails framework has some ideas to it that I think are really nice, so I think it's more a practical exercise than an attempt to stay buzzword-compliant. So sitting beside my desk right now is a new Intel-chipped iMac. First one out of the Glendale store. I get to play this afternoon, but first lunch. Back in November I extolled the virtues of XBox Media Center. Tonight I found even a new use for it. I had ordered a pair of cds through CD Baby and today they came in but I realized that with my laptop sitting at work I didn't have a PC with a CD-ROM drive in it. XBMC saved the day, though, ripping the cd and encoding to nice 192Kbps mp3s through lame. Then I just ftp'ed them off of the XBox and into my music collection. Really, really easy and quick. I just realized that the Jay Nash show I had thought was this upcoming week was actually this past Thursday. Then I had that scary moment where you say, "I really hope I didn't miss a court date this week." Maybe most people don't have that moment. It was a very vivid one for me. But no, my day in court is this upcoming Friday at 8am. If you, like me, have forgotten what this was all about, it's from the stupid ticket I was given heading down to Long Beach with my bicycle.